They have a LOT of stuff. We live in an age when it’s easy to amass more and more stuff. 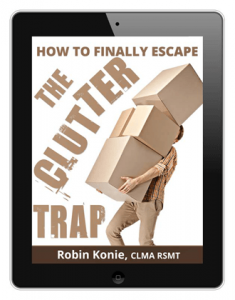 That’s why when I got a hold of Robin Konie’s newest e-book The Clutter Trap, I started devouring it immediately. It’s not about organization. It’s about getting rid of clutter once and for all. Normally, when you read a book about how to de-clutter your life, it’s all about how to organize your life. There are plans for organizing your closets, your receipts, your bills, your kitchen. This book doesn’t do that. One of the biggest misconceptions about organization is that as long as everything has a place (and you know where everything is) that you are organized. In fact, “a place for everything and everything in its place” is just a trap to get you to spend more money on things you don’t need (files, boxes, and the like) to help you “organize” the stuff you never needed in the first place. It wastes your time and your money. Many people also think that because their home doesn’t look like an episode of Hoarders, they’re basically already clutter-free. But if moving’s taught me anything, it’s that clutter comes in many forms. It’s the little odds and ends that end up permanently living on our counter tops or in our bookcases, the pictures that are waiting for frames or for nails so we can hang them, the stuff we “clean up” once every few months by simply hiding it in a closet so we won’t have to decide what to do about it until later. It may not be “messy,” but it’s ever-present. But why get rid of clutter? What’s so bad about it? I approach this two ways. The first is thinking of what I’ll leave behind. In a seminar I once attended on Death & Dying given by a former hospice chaplain, the speaker challenged us all to think about what going through our clutter does to those who survive us. There’s nothing quite as horrible as being in the throws of grief while having to pluck through the remaining earthly possessions of your loved ones and decide what you’ll keep, what you’ll sell, and what will be tossed on the curb for the garbage man to pick up. Do I really want my own children to feel that way about me? Do I want them to have to go through decades of clothing in my closet, piles of old paperwork in my desk drawers, mountains of old textbooks and schoolwork, kitchen utensils I never actually use, books I never actually crack open, years worth of bills I kept for my records, and a lifetime’s worth of knick knacks that just take up space? Seen this way, my clutter has a future cost, paid by those I leave behind. 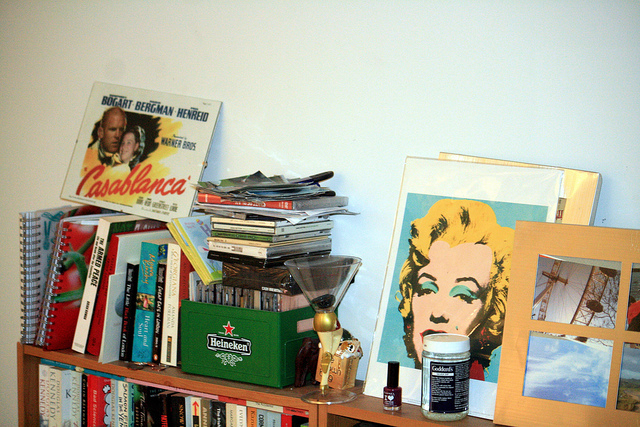 The second reason I need to get rid of clutter has to do with what clutter costs me in the present moment. In her book, Robin pushed a lot of buttons for me with the following passage. Getting rid of clutter ELIMINATES 40% OF HOUSEWORK in an average home. Men who organize their home offices are more likely to spend time PLAYING WITH THEIR CHILDREN than men whose home offices are in disarray. Household order was positively associated with a range of EARLY READING ABILITIES in kindergarten and first graders. The average home costs $209 to de-clutter and on average will add $1,190 to the sale price of your home. That’s a 586% return on investment just from GETTING RID OF EXCESS STUFF! What is your clutter costing you? To answer that you’ll need to think about what you would gain if you let go of the stuff you don’t need or want… and even some of the stuff you think you want. These are real things. Things I value. Who doesn’t want more time with their kids? Less time doing housework? The real strength of The Clutter Trap is that Robin doesn’t try to create a single clutter-free action plan that is supposed to help anyone and every one. Instead, she talks about what she calls clutter profiles. These profiles help us understand WHY we let our lives get cluttered so that we can address the root issues behind what’s causing the clutter. They also create a tailor-made way for us to tackle the decluttering of our lives in a way that ensures lasting success. I mostly fall into the “I Spent Good Money” profile. I have a hard time getting rid of stuff that I spent money on because a part of me believes the lie that by holding onto what I’ve already bought, I’m saving money. The truth is that my clutter is wasting money, every single day. Not only does it cost money to store it and move it, but it costs me time and emotional energy, too. When I was a first-time parent, I saved all the baby things — bouncy chairs, baby monitors, baby swings, clothes. It was an entire closet full of stuff. After all, I had paid good money for it, and I didn’t have much money at the time. I’d need it for the next baby (if/when the next one came along)! Then we moved. I had to face a choice. Do I move with this stuff? Take the time and energy to pack it up, make the space in the moving van, the time and energy to unpack it? Or do I try to sell it on Craigslist? I made bank. EVERYONE NEEDS BABY STUFF! I used the money to help fund the move. Then, THREE YEARS LATER when my next baby needed stuff, I shopped for nice used baby things on Craigslist. It felt like it cost next-to-nothing by comparison. I lived three years free of baby clutter. Treating that baby stuff like a liquid asset — able to be sold quickly for cash (and possibly re-acquired later at no loss) — saved me money, work, time, and sanity. The point is, by knowing what keeps me holding onto stuff, I can change my perspective enough to help me be free of it. Maybe it’s not about frugality for you. Maybe it’s about keeping memories or being too busy to de-clutter. 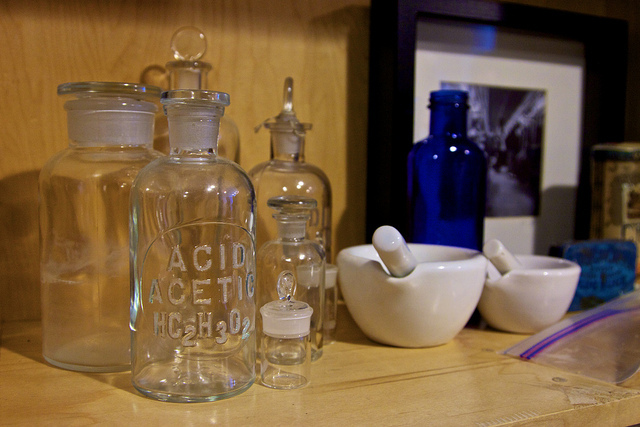 Whatever it is, knowing your clutter profile will help you escape the clutter trap for good! The takeaway: Get this book! The truth is, we are so inundated with stuff that when we run out of room to store it in our homes, we actually rent storage space for our overflow. Did you know that in the past decade, the number of American households renting storage space has doubled? Despite the fact that the average home size is growing and the average size of the American family has shrunk? I’m here to tell you that EVERYONE needs this book, and EVERYONE can afford it. That’s because from now through Saturday, March 8th, Robin is selling the e-book (well ALL of her e-books) for whatever price you’re willing to pay! You get to name your price. 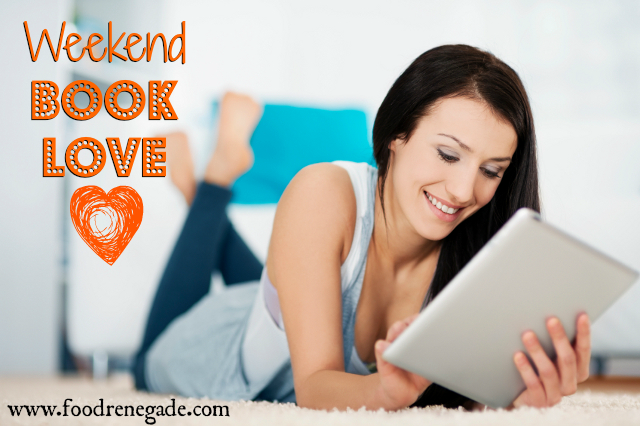 This is the 13th in a weekly Weekend Book Love Series (see them all here). Next week, I’ll be reviewing Mary Vance’s 3 Weeks to Vitality. I sometimes play the if i was moving game when going through my things. Basically for every item, you say to yourself: “if i was moving would I pay to have this packaged up and moved?” It gets the point across. So awesome! I’ll have to read this! I’ll be moving this summer! Love the app by the way!! I am moving right now. It is hell! Thanks for this!! Ha! I’ve moved 6 times in the 6 years I’ve been married (3 of them across country). Even my 5 year old knows what it means when the boxes start coming out again. Ready to start settling down…. Elvia Terrazas Rascon, thanks! I appreciate the feedback. Corinne Brannigan, thanks for letting me know! Corinne Brannigan — It’s still a good offer. Robin extended it exclusively for Food Renegade readers. So, you can still name your price through March 8th. So, is there a discount code for name your own price? I ordered but can’t open. It says not valid or something on the download link. I don’t see how I can communicate directly with her …wondering if you can help? Allyson Did you get an email that thanked you for your purchase and included a download link? If yes, then the email address that came from is the one you need to respond to as that’s her customer service email address. Hope that helps! When my father-in-law died, I helped my mother-in-law clean up his stuff and help her get ready to move. It was like an archeological dig. 2012-2005-2000 and I swear to God, some of the crap had a 1995 expiry date. Junk and trash – great way to remember him. And I’ve got a husband who “paid good money for it” and now you can’t move in the garage. And I can’t convince him that he doesn’t want his kids to go through what we went through with the f-i-l. Augghhhh!!! Yes but the link doesn’t work.